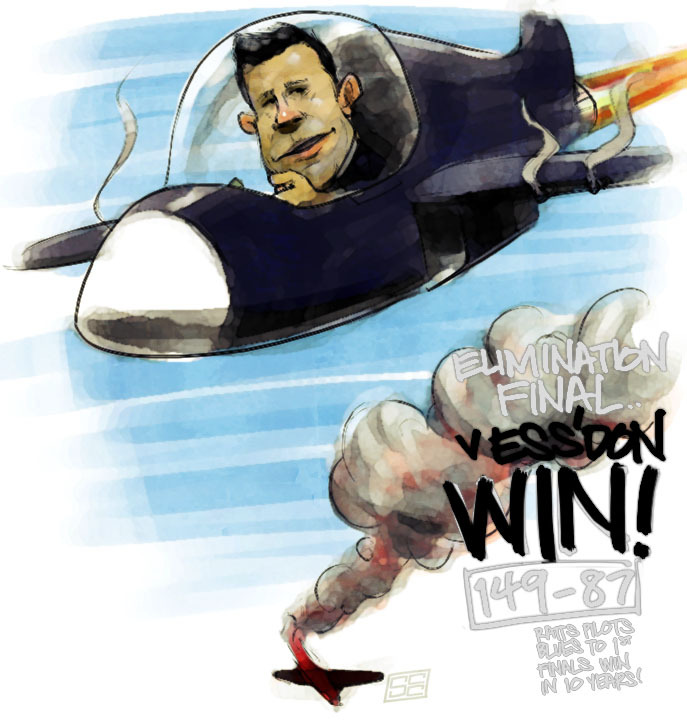 Carlton demolish Essendon by 62 points to win our first Final for 10 years!!! Goalkickers: Betts 4, Garlett 3, Gibbs 3, Walker 3, Thornton 2, O'hAilpin, Robinson, Murphy, Simpson, Judd, Carrazzo 1. Carlton’s third consecutive elimination final appearance presented the opportunity for their first victory in a final since 2001. It had simply been too long. Pitted against the arch enemy Essendon in front of a near capacity MCG crowd the big questions were certainly being asked of the playing group. Were the lessons from the previous two heart-breaking elimination final losses going to stand them in good stead or would it all count for nought? The big omission at selection was Matthew Kreuzer. After having his foot “nod off to sleep” against the Saints in the final home and away game, Kreuzer had minor surgery to sort out a cyst at the root of the problem and was always going to be an unlikely starter. Joining him on the sidelines were the seemingly out of favour Jordan Russell, as well as Zach Tuohy and Kane Lucas (bet he hopes he doesn’t have to wait as long as last time for his next run). Four fairly solid bodies, suited nicely to finals footy, were waiting in the wings as replacements. Andrew Carrazzo, Michael Jamison and Bret Thornton added some extra experience, while David Ellard gave the Blues another hard body (with extra grit for good measure). The mystery surrounding the will-he-or-won’t-he play again this season kept Jarrad Waite’s name in the papers and on the talk shows for another week. His non-appearance in the VFL suggesting his chances of another crack at AFL level in 2011 are diminishing rapidly. As play got underway the lovely spring sunshine on the ground gave a somewhat misleading impression with an icy breeze whistling through the stands of the MCG. Chris Judd won the toss and elected to kick with that same breeze and for the most part, one important item aside, his decision seemed to pay dividends. The Blues flew out of the blocks and absolutely dominated possession during the opening five minutes. That one important item that was missing was a goal. Five behinds were registered before Essendon even looked like scoring. Judd went closest with a poster, but gettable shots from Setanta O’hAilpin, Chris Yarran and Eddie Betts (to a lesser extent) were deflating for supporters and players alike. Sure enough the first opportunity the Bombers had when they went forward sailed right through the middle, as did two more in relatively quick succession, and before you knew it the Blues were on the back foot and desperate for a goal. A sigh of relief came in the 20th minute when O’hAilpin marked on the edge of the goal square and alarmingly played on, shanking the left footer through the big sticks. The goal was the settler the Blues needed and during the next ten minutes they wrestled back control of the game and went on a run of their own. The precise goal kicking of Andrew Walker and Jeff Garlett was in stark contrast to the opening of the quarter with Garlett’s two goals from the boundary line in both pockets truly superb. When the dust settled on the first quarter the Blues held a seven point break which in truth should have been a lot more. The second term was everything the first could have been as they piled on six more goals without a reply from the Bombers until the 29th minute. By that time Carlton had racked up ten consecutive goals and a healthy lead to stamp their absolute authority on the game. It started in eerily similar fashion to the first with several behinds before Mitch Robinson, playing the defensive forward role on Fletcher, got away on his own after Walker put the ball into space and he ran into the open goal. Bret Thornton had started brightly taking several strong marks, but his mark and goal from just on 50 to extend the Blues lead was the most important to that point. Soon after Thornton was involved again after Eddie Betts threaded a beautiful stab pass to him from the spillage whereupon he offloaded to Garlett who ran in for the easiest of his three goals. Bryce Gibbs then followed with his first goal before Betts bombed one from long range, bouncing three times before it crossed the line. Marc Murphy had been the Blues most dominant player for the half (though Robert Warnock certainly pressed strong claims) and he finished off the run of ten goals with his first. Essendon got one late in the term to reduce the margin to 41 points at the long break. As reassuring as a seven goal lead can be it always provides additional comfort to me when it’s nearer to ten. Thornton continued with his best game of the season, marking just about everything that came near him, and also grabbing the Blues opener for the half. The Bombers responded quickly, but it wasn’t long before the Blues took the game by the scruff and really made it theirs. A goal to the running machine that is Kade Simpson and a second for both Betts and Gibbs really put the result beyond doubt. Not only were the goals flowing for Carlton but their defence seemed to have all the answers. The doubt over Jamison seemed unfounded as he played his role to a tee while Lachie Henderson continued to look more and more like his best football is played at that end. Andrew Carrazzo had kept Watson completely shut out, while Dennis Armfield and Heath Scotland hardly put a foot wrong all day and delivered with precision out of defence on numerous occasions. Judd had been relatively quiet by his lofty standards but entered a couple of nominations for the highlights package with a lovely snap goal from about 50, followed soon after by the mark of the day - a wonderful old fashioned high leaping screamer in a congested pack. The Blues finished the term with two late ones, making it seven for the quarter, as both Betts and Gibbs notched their third respectively. With the lead beyond that comfort inducing ten goal barrier (62 points) it was really just a matter of how far Carlton? The final term seemed to take an eternity. The game was over and in some ways it really was just going through the motions. Players from both sides were still going in hard, but the result was a foregone conclusion. Walker continued the rout as he put through two more, while Betts clocked up his fourth for the afternoon and Carrazzo managed to get forward and kick the Blues final goal. After playing a wonderful negating role for much of the day it was a deserving reward. The Bombers managed five goals, most of which came in junk time, to break even for the quarter but the Blues ran out commanding 62 point winners. The reward for the comfortable victory is the long flight west to meet the Eagles at home in a cut-throat semi-final. A cloud hangs over Gibbs whose shoulder was crunched in the goal square late in the game, while (without question) the names Kreuzer and Waite will get plenty of air time in the lead up to the big final. Score Records: This was Carlton's largest winning margin over the Bombers in a Final. Interesting Fact: This was the first time Carlton and Essendon had played in a final since the year 2000! Horrible Fact: This would be Carlton's first final in Melbourne for 10 whole years! Contributors to this page: WillowBlue , PatsFitztrick , Jarusa , snakehips , molsey and pblue . Page last modified on Thursday 27 of September, 2012 09:15:00 AEST by WillowBlue.